My words : Exactly ! What you have today is not a commitment to equity. You can never have commitment to equity without four letters “D-A-T-A”. This reminds me of an essay by GK Chesterton whose works I am reading at the moment. The collection of essays under “The Miscellany of Men” is available online here. Read the chapter “The Mad Official – Chapter VIII”. I highly recommend G.K. Chesterton’s works to anyone who has not already discovered him. Start with the American Chesterton Society website for more. This essay (The Mad Official – see above ) contains a gem of a paragraph. Let me reproduce it below. It is a mere difference of degree that separates any operation from any torture. 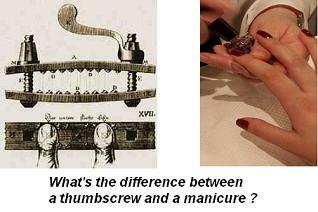 The thumb-screw can easily be called Manicure. Being pulled about by wild horses can easily be called Massage. The modern problem is not so much what people will endure as what they will not endure. Note: The Thumbscrew was a notorious medieval torture device. More here. This is what we face today in India, we are unable to comprehend that a terribly broken system is no system at all – rather a mode of torture. In the context of Mr Singhs commitment to equity – torture to both natural and social justice. Social justice focused on equity = Manicure, Social justice focused on caste equations = Thumbscrew. There are a lot of folks who ask a question, “Yeah we have fair price shops, tax systems, that are equally broken and corrupt. If you can put up with this – why cant you put up with broken social justice” ? To a naive person, this would appear to be a loaded question. The answer to the question lies in the everlasting concept of equity and fraternity. First, there are two parties to a social justice policy. 1. A group of people who have to accept an abridged right to equality, in the larger interest of the country. In India, this is represented by the forward classes. 2. A group of people who have a right to social justice to address their current deprived positions. The reason for their current deprived position may or may not be due to past oppressions. SC/ST current position is due to past and present oppression, but Muslim position is not. By having a broken ration shop, people may lose their access to low price staple groceries. As bad as it sounds, nobody has a fundamental right to low price food, or tax incentives, or clean water, or livable cities. Policies that affect these are merely a failure of governance. However, a broken social justice policy is a different animal altogether. This deals with fundamental rights of human beings. A policy without any sociological or statistical base affects TWO groups. It trespasses on rights to equality of group 1, and equally importantly right to social justice for group 2. Like G.K.Chesterton would say, Mr. Singh “it is only a matter of degree”. « BPD – Good luck guys ! Some people say that it is better to have a law that is not applied than to have no law at all. The former are intellectuals (like Rc?) who believe that writing something down today will pave the way to it being realised at a later date. In a parliament that has a great number of members connected to mafia it is too much to ask. thanks for links to some excellent material. BTW, there are people who believe it becomes ‘equity’ if it is just typed in caps – EQUITY. REPRESENTATION. There are two other problems in the Indian psyche, apart from being unable to comprehend the concept of degree. The first is the black and white syndrome as far as public figures are concerned. A public figure is either a God or a demon. The second is lack of political consciousness. Indians think that politics is about winning. Our notion of winning is primitive – a group of men sneaking up on another and clubbing him mercilessly. No other outcome is satisfactory. Indians are also deeply religious in a mystic way and I am unable to decide whether the BJP or Cong leaders (even the Hindu ones) are more religious. Socialism in India emerges from the crude idea that if you throw a few annas to the beggar every day, you will go to heaven. The completely insincere approach to social justice by the most verbal proponents can only be explained by this. >> Indians are also deeply religious in a mystic way and I am unable to decide whether the BJP or Cong leaders (even the Hindu ones) are more religious. Barb – you ignored a recent convert – DMK chief, dravida rationalist, witnessing his beloved grandson receiving blessed rings from the Sai Baba. I believe that individuals in their microenvironments can do a lot of good as well when compared to mega projects (this in no way diminishes the responsibility of the state in reducing poverty/providing a decent living for the poor). In the western Europe where the welfare state has been perfected, it is often seen that the state is often called upon to solve problems which the near family/village could have provided in a non-welfare state like India. The idea of throwing a few annas to the begger to go heaven is not crude- it ensured that people spare some thought for their fellow beings. May be they should have thrown a few rupees..
As far as relegion and socialism are concerned, hindu relegion (if such a thing exists) is the least social of all compared to christianity and islam. Yes, I read about it but I can’t decide which is funnier, this or that his kid is called Stalin. Whatever I may have against Stalin, I always feel sorry for what he has to go through having been named such. I wonder why he didnt get it changed after the truth about Stalin and his concentration camps was revealed. hinduism has very little to do with socialism.one finds all types among hindus.clear headed,confused,emotional,calculative etc. i liked your joke about every one wanting to be STs.but i find your remark on stalin hilarious.karu ,even now,might have no clue as to who the original stalin was.It should be the same with his son.Even if he comes to know the real nature of the russian dictator ,karu may not feel embarassed.Being the demagogue that he is,karu might regret that he could not re enact stalin in a much more benign clime.”Thalapathi” is not in the same league as karu,but he is blissfully ignorant of most things beyond his household.Most tamizh ‘pakutharivalars’ have no historical sense or ,for that matter,any sense.